Please refer to our stock # rs1 when inquiring. This stunning butterfly pin was custom made by contemporary designer jeweler, Robert Sorrell, for Lush Life Antiques. It is an oversized 3 7/8" long x 3" wide and is quite dimensional. 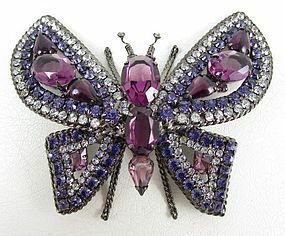 It has large faceted amethyst crystals with lilac and clear rhinestones trimming the wings. The twisted wire trim on the wings and legs give this pin interesting dimension. It has a Japaned finish and the it is signed "Sorrell Originals" on the reverse.